Get easy-to-use, highly secure, and highly cost-effective voice communications for small to large businesses. Building on 7821 is a two-line endpoint for knowledge workers and managers, on-premises or remote, who have light to moderate voice communications needs. Contact center agents that support small call-queue environments could also have interest. It comes with two dedicated programmable line and feature keys, a 3.5-inch (89-mm) backlit display, and support for third-party headsets. Wideband audio comes standard on the handset, headset, and speakerphone. The 7821 comes in both charcoal and white colors. Ease of use with backlit displays to enhance viewing and navigation, headset and speakerphone support on most models for added flexibility, and ergonomically rounded keys for superior tactile experience. 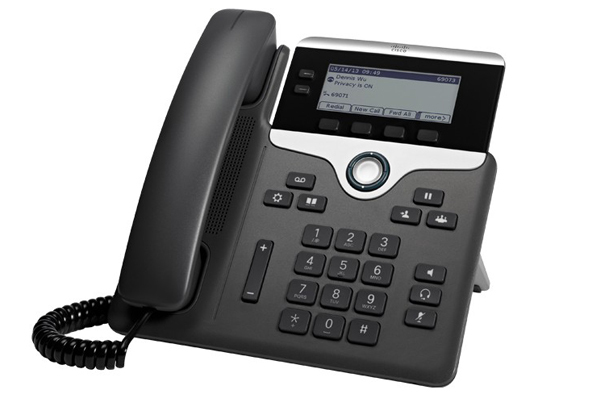 ● The phone offers an easy-to-use interface and provides a traditional telephony-like user experience. ● Provide scrollable access to calling features and text-based XML applications. ● The handset is hearing aid-compatible (HAC) and meets Federal Communications Commission (FCC) loudness requirements for the Americans with Disabilities Act (ADA). You can achieve Section 508 loudness requirements by using industry-standard inline handset amplifiers such as Walker Equipment W-10 or CE-100 amplifiers. The dial pad is also ADA-compliant. ● Full-duplex speakerphone allows gives you flexibility in placing and receiving calls. For added security, the audible dual tone multifrequency (DTMF) tones are masked when the speakerphone mode is used. ● The IP Phone 7821 includes a default black bezel (replaceable), and an optional silver bezel is also available separately. ● The display is easy to view and the buttons and keys are easy to use. The two-position foot stand supports viewing angles of 30 degrees and 45 degrees; you can remove the foot stand for wall mounting, with mounting holes located on the base of the phone. ● The phone can be installed on a wall using optional wall-mount kit (available separately).